To support students from third countries (non-EU, non-EEA and non-Swiss nationals), the FH Kufstein Tirol offers all the students concerned a special scholarship that is available for the duration of studies and that limits the tuition fee to € 363.36 per semester. 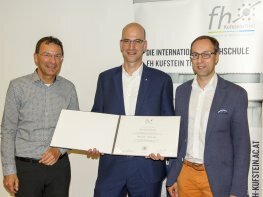 In this way the FH Kufstein Tirol significantly supports students from third countries und furthermore makes a contribution to making a lasting improvement with regard to the lack of qualified personnel in technical areas in the economy. Applicants are not required to submit a separate application as they will be automatically considered for the scholarship as part of the application process. Third country applicants (including applicants eligible for the Equal Opportunities Scholarship) have to pay a tuition fee deposit of € 100 with their online application. Please see www.fh-kufstein.ac.at/tuitionfee for more information.